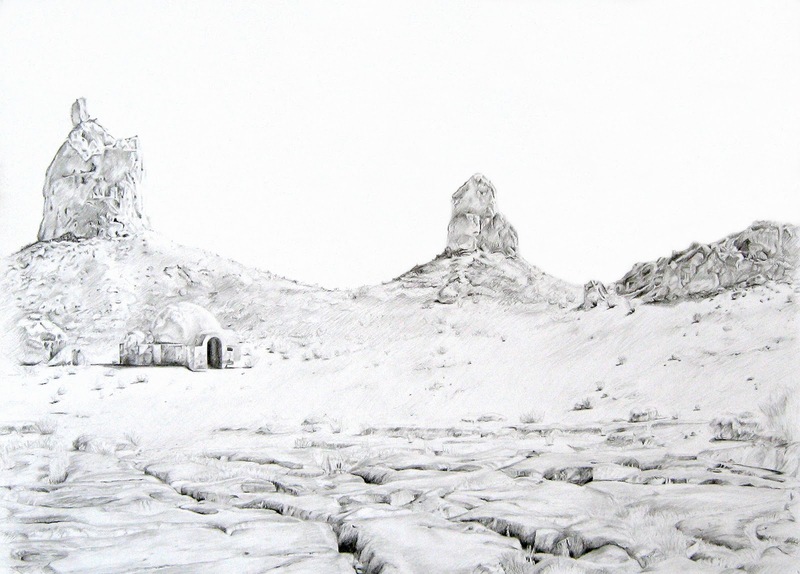 Charlie, Berlin, Germany, 2011, Graphite on Paper, 10.5" x 14"
Pamela Valfer has exhibited at many national and international venues. Selected exhibitions include: Burren College of Art (Ireland), Space Shower Gallery (Japan), Dante's Upstairs (Australia), CUBE Center for the Urban Built Environment (England), GrayDuck Gallery (Austin, TX) and Art of This! (Minneapolis, MN). 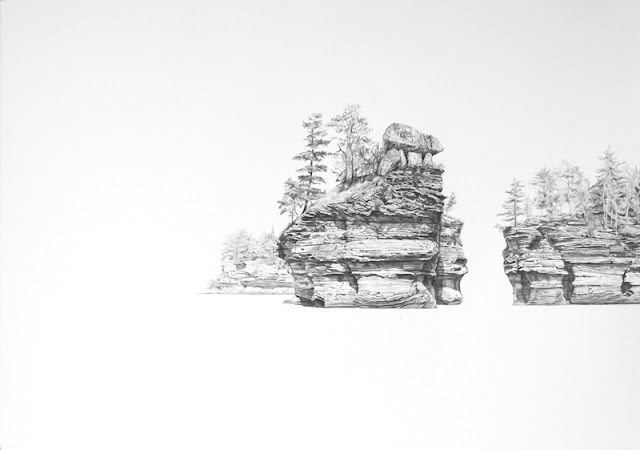 She has received both a Minnesota State Arts Board - Artist Initiative Grant and Bush Education Grant, and is included in the Drawing Center's (NY) curated Artist Registry. Pamela received her BFA from Minneapolis College Art and Design and her MFA from the University of Minnesota. She is currently teaching at Minneapolis College of Art and Design and College of Visual Arts. Graphite on Paper, 19" x 28"
I am currently working on the idea of a “contemporary landscape”. I am also interested in questioning what is “an original” experience in visual imagery, [or exploring what is a “copy”]. These interests have articulated themselves in a few bodies of work that I am developing. One series I am working on is my “Landscape Simulation” series. 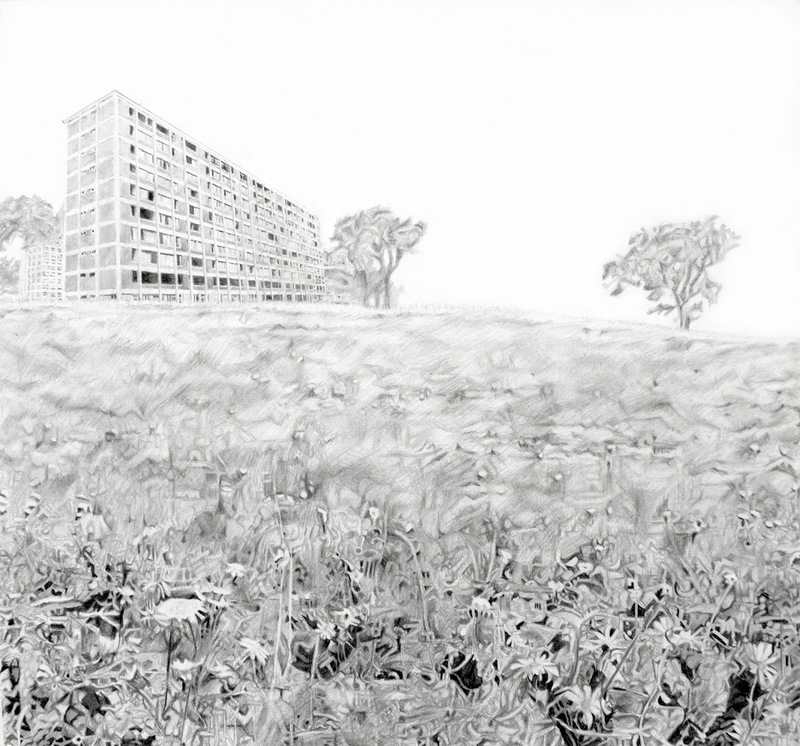 These are detailed drawings of hybridized landscapes created from a pastiche of movie, television and “actual” landscape spaces. I am also playing with photography in some newer work that I call my “Drosscape” series. 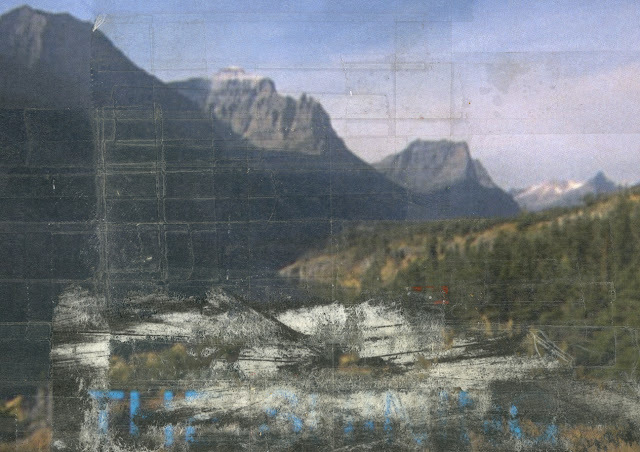 In these works I am generating collages created from found photos, magazines, collected Xeroxes, etc.– a general flotsam and jetsam of visual source materials. 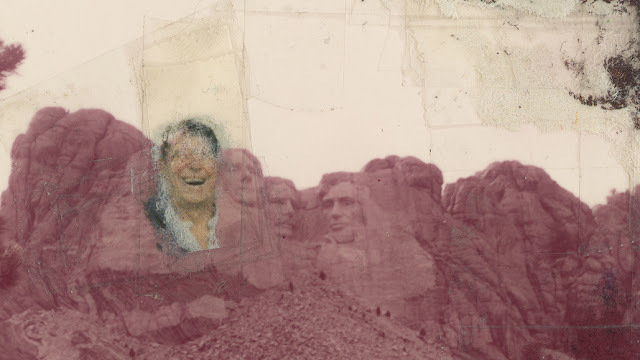 I am then re-photographing the finished collages to create a new visual vernacular. The photography tends to gel the images as well as raise the question of originality. I have also been playing around in the studio with a few new ideas. I have been exploring the idea of the “ruin” through drawings of models of classical ruins (i.e the Pergamon) or implied historical architecture (i.e Hearst castle). 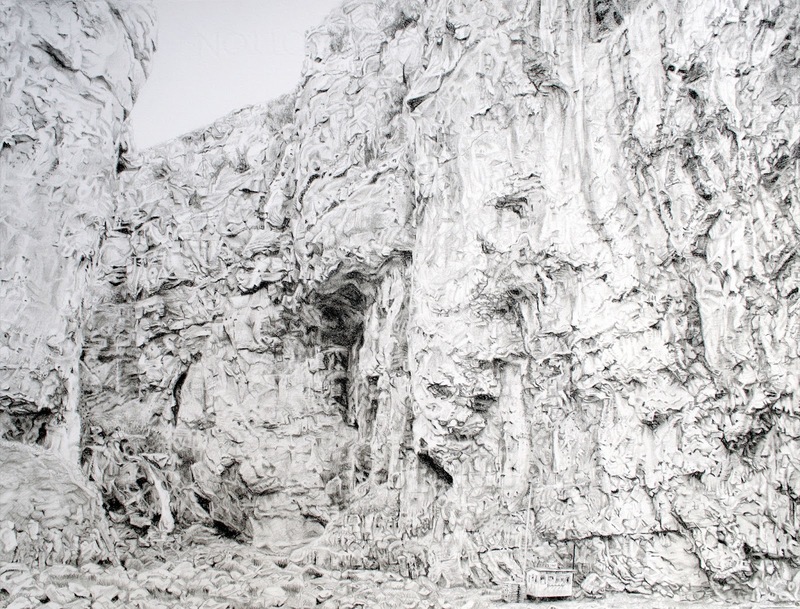 There has also been some large scale drawing-esque installations that I have been interested in – so much stuff – so little time…..
2011, Graphite on Paper, 19" x 28"
I have always vacillated between art and music and have spent many years focusing on my musical endeavors over my visual art. Well, now the pendulum has swung and I’ve been mainly focusing on my visual art. As far as, has there been a “light bulb moment” where I knew I would be an artist?? - I can’t say I had one. It seemed to be the only path that fit. It was never really a choice. Show up. I think that is the singular best advice I have received, as well as the advice I give my students. The biggest hurdle is to just show up to the studio. It is not easy but you have to remain committed to being in that space, even if you are just reading a book or starting at a blank wall. You need to work that time in your life as important – which is difficult when other pressures in your life demand your attention. I sell work in different ways. I have sold work through my website, through galleries, and directly out of my studio. As far as marketing, I think social media is a huge component of marketing yourself these days, having a website, tumblr page – all these things are the new “postcard”. You have to be savvy to all the technological and non-technological outlets. Green), 2011, Graphite on Paper, 16.5" x 17.5"